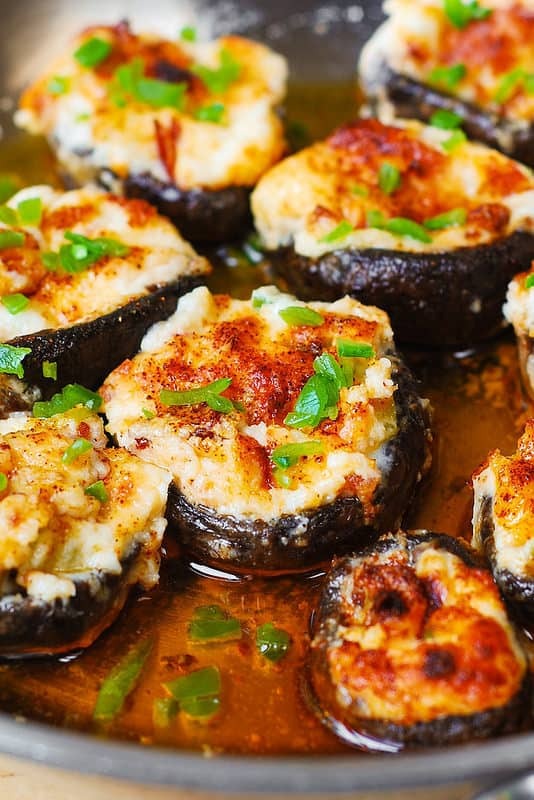 Bacon and Cheese Stuffed Mushrooms – delicious, homemade bite-sized mini-appetizers loved by adults and kids alike! The stuffing is made with Parmesan and Mozzarella cheeses, cream cheese, bacon bits, finely chopped green bell pepper, with a touch of Cayenne pepper. Baked in a small amount of butter, with a splash of lemon juice. As most of my recipes are, this one is very easy to make. I made these bacon and cheese stuffed mushrooms one day right after work at 6:00pm, and I was able to take pictures too, even though the days are noticeably shorter. That tells you how easy and fast these are to make. These mushrooms are a great appetizer to serve before pasta dish, such as Creamy Chicken Pasta with Sun-Dried Tomato and Mozzarella Sauce or Chicken Pesto Pasta with Mushrooms. Clean mushrooms by carefully wiping them with a damp paper towel. When making the cheese stuffing, make sure the cream cheese is softened but not too soft. The cheese stuffing should be very thick and should be able to hold its shape. 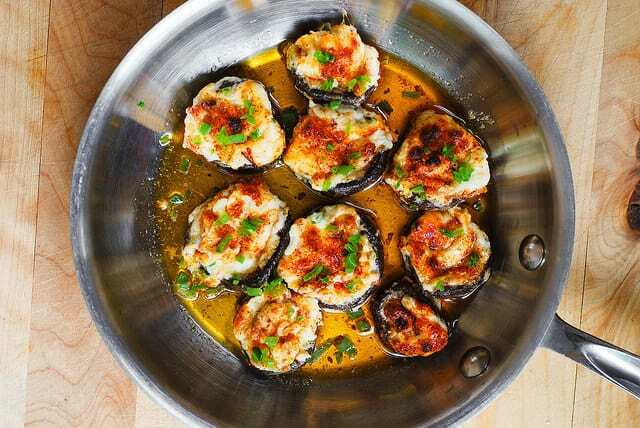 Once the stuffed mushrooms are done, add lemon juice to the butter. Use butter for dipping bread. Garnish stuffed mushrooms with freshly diced bell pepper, chopped green onions, or chopped parsley. 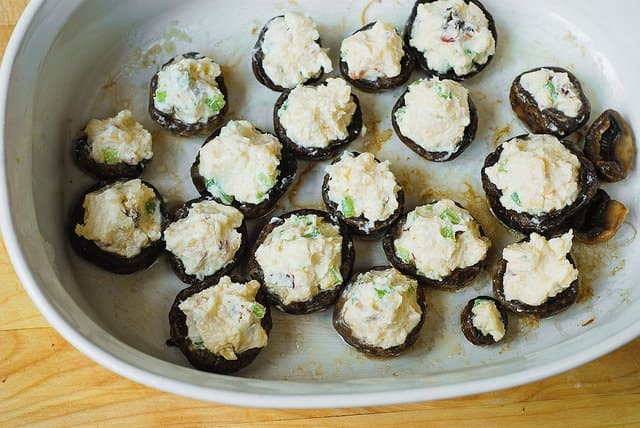 Bacon and Cheese Stuffed Mushrooms - the stuffing is made with Parmesan and Mozzarella cheeses, cream cheese, bacon bits, finely chopped green bell pepper, with a touch of Cayenne pepper. Baked in a small amount of butter, with a splash of lemon juice. Dip all mushrooms into melted butter to coat the outside of the caps. You will have some butter left - use it later to pour into the baking pan. Place mushroom caps upside down (caps side up) into the baking dish, sprinkle a little bit of salt on top, and bake for 10-15 min to get extra water out. 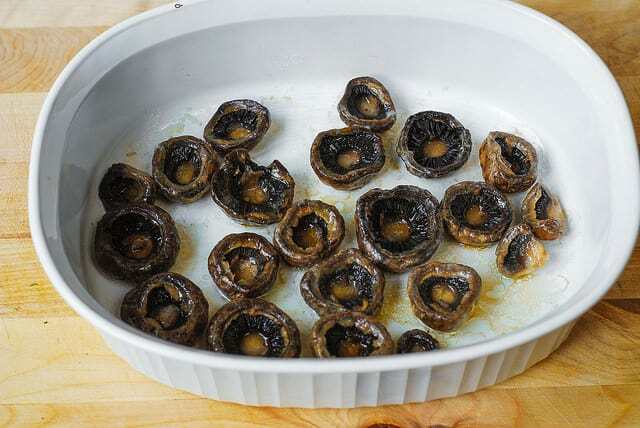 After 10-15 minutes, remove mushrooms from the oven, flip them all over, draining the caps of any accumulated liquid - drain it right back into the baking dish. 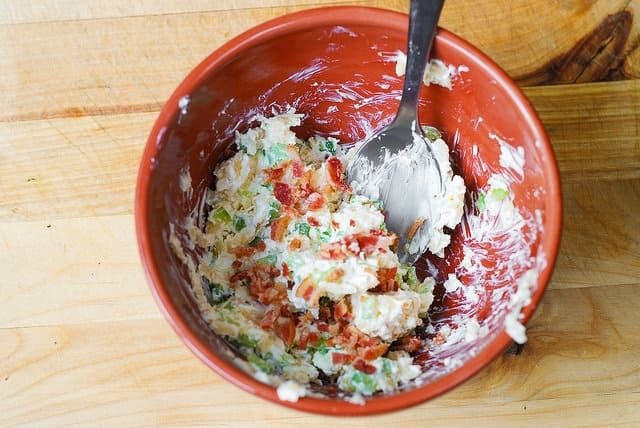 In the mean time, in a medium bowl combine and mix softened cream cheese, Parmesan cheese, Mozzarella cheese, bacon bits, finely chopped bell pepper, a splash of cayenne pepper. Season with salt to taste. Note: cream cheese should be softened but not too soft, not melted. Mixture should be very thick. Using a little spoon, fill each mushroom cap with a generous amount of cheese and bacon stuffing, slightly mounding the mixture. Arrange the mushroom caps in the same baking dish. 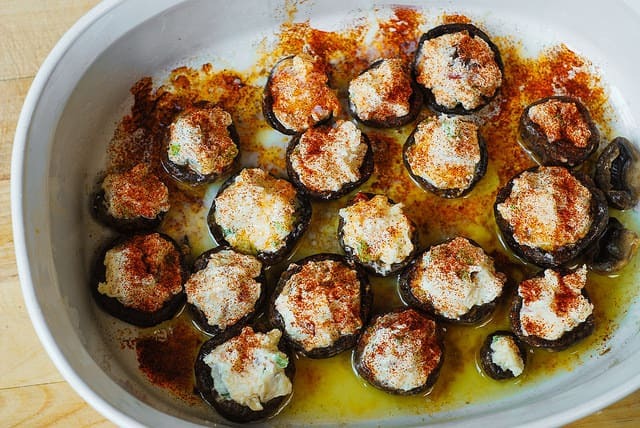 Sprinkle a small amount of paprika over the cheese stuffed mushrooms (for color, mainly). 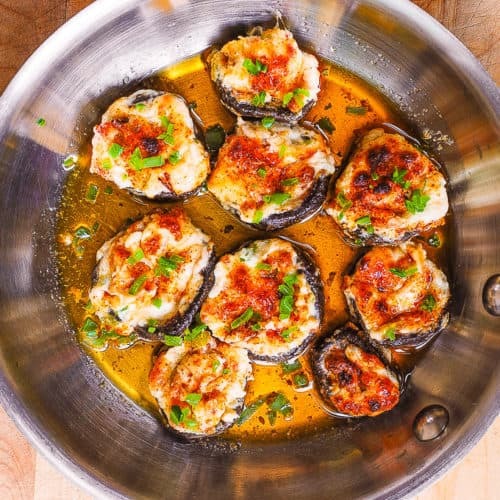 Pour any remaining butter you have into the baking pan, not over the stuffed mushrooms directly, but in the bottom of the pan. 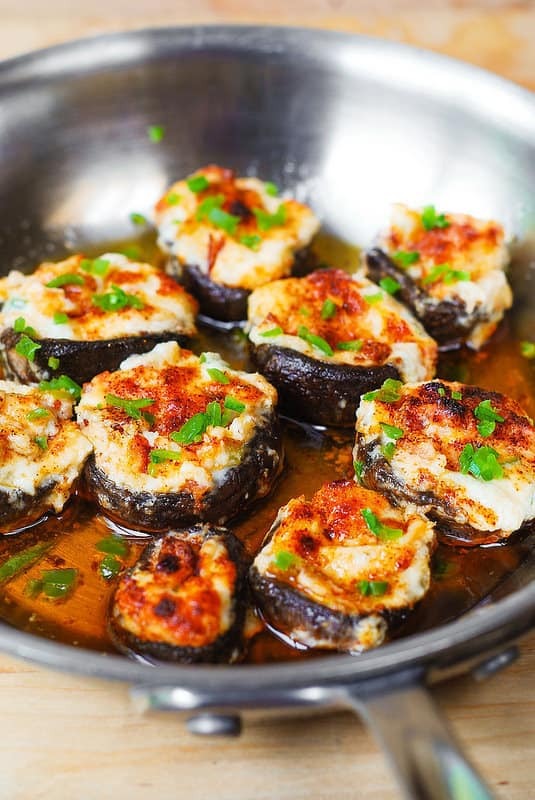 Bake for 20 minutes in the preheated oven, or until the cheese and bacon stuffed mushrooms are piping hot. Garnish mushrooms with freshly diced bell pepper, chopped green onions, or parsley. Can they be assembled and frozen? Can this be stored for a day before going to oven? 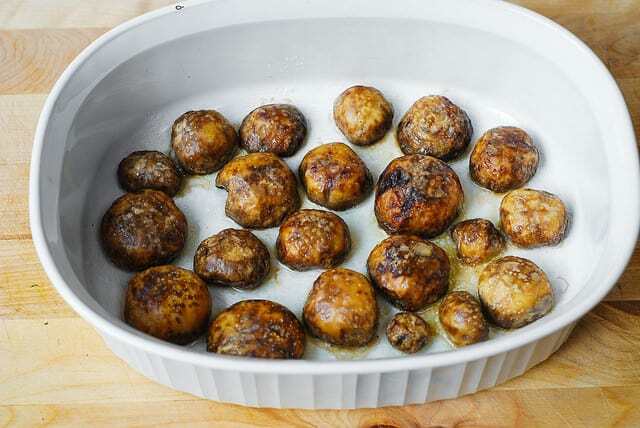 In the recipe, the mushrooms should be prebaked for about 10 minutes (to soften) before all the stuffing is added. Because of this additional pre-baking step, I don’t think it will work well to store these in the refrigerator for a day before baking them in the oven.